Cats are only able to see the same colours as a colour blind person these colours are yellows, blues and violets all of which means Cats can’t see reds, greens or oranges. This is because, while the retinas of Cats are similar to humans, they contain two types of light-receptors called rods and cones, humans are different and have more of the cone types than rods and it’s these cones that are responsible for colour vision. Happily Cats and for that matter Dogs (if they really mattered of course) have more rods and it’s the rods that are the receptors responsible for seeing in the dark. This means that Cats may have poorer colour vision than humans, but fortunately we have far superior night vision, and as an extra bonus we are so much better at tracking movement all of which means that clever Cats can see things eight times better than mere humans in the dark. 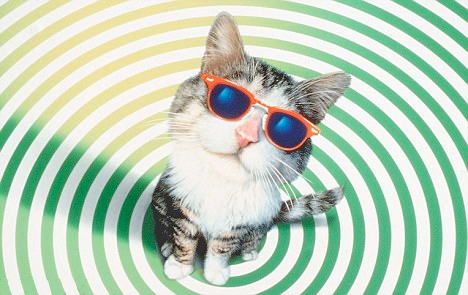 It must be stated that Cat’s, unlike Sid the Sunglass Cat (pictured), do not normally wear sunglasses, or should that read – normal Cats do not normally wear sunglasses?